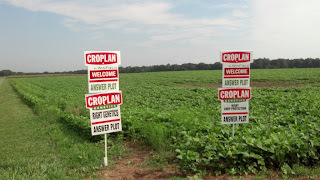 Chances are if you drive down any rural roads, or even along some not-so-rural roads, you have seen farm signs identifying fields where particular varieties of crops are grown. 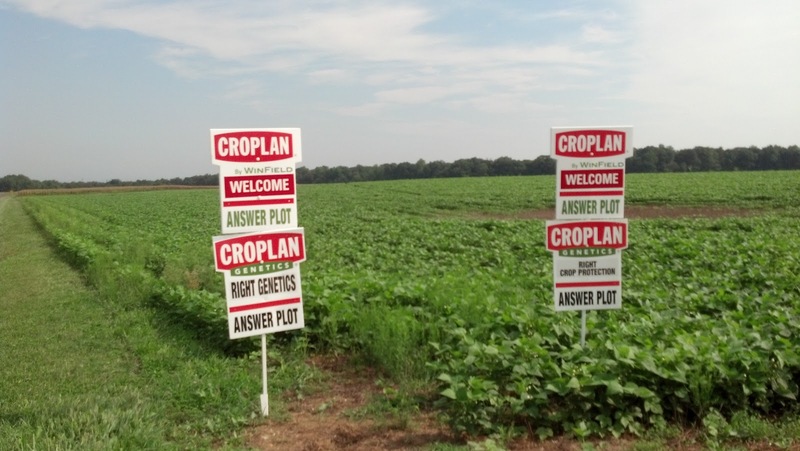 Typically, when multiple signs are positioned relatively close together, then this is some type of on-farm research being conducted. 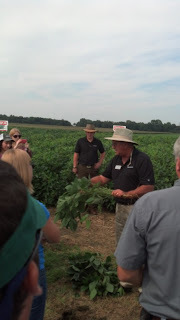 Our family farm has been doing on-farm research for over 50 years. On-farm research benefits us greatly in that while we take chances on new crops, new varieties, new techniques, or new technology which may or may not pan out, research helps us to make strides toward improving our soils, our environment, and the foods we grow. Research is that thirst for knowledge that leads you further down the road toward achieving your goals. 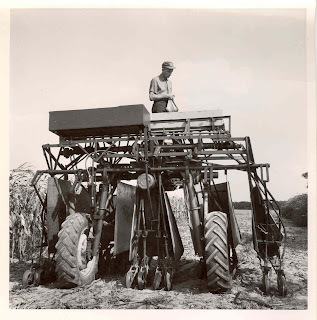 This picture above is from 1964 of my father-in-law operating a HiBoy CoverCrop seeder for No-Till farming. Back in those days, they called it "trash farming" and tested it out on remote fields where their fellow farmers and neighbors wouldn't laugh at them for having "trashy" looking fields. 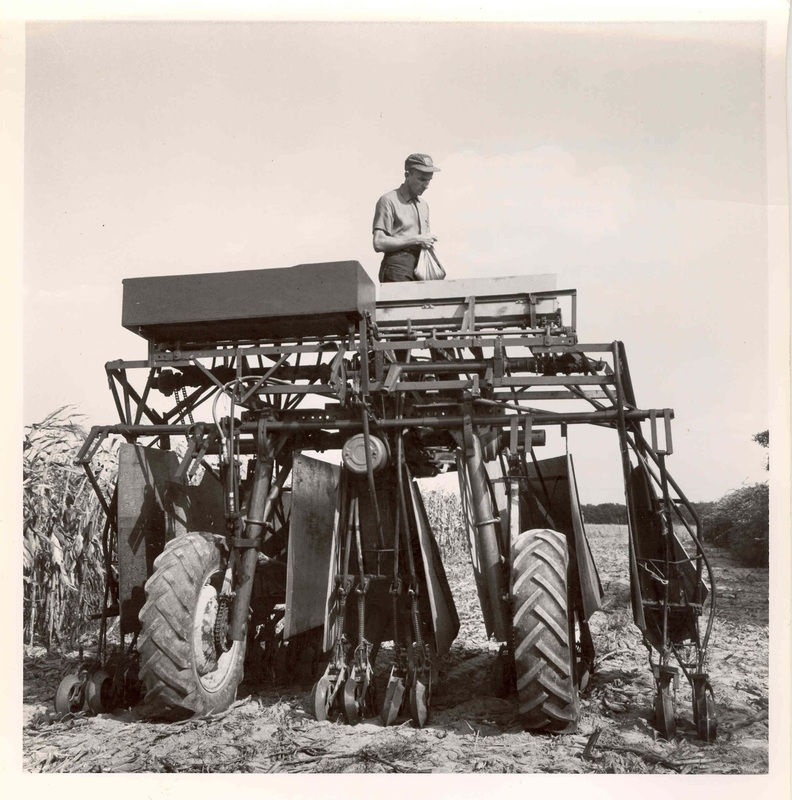 Back then, no-till was rare and unusual. It would take nearly 35 or more years before no-till became more accepted as a standard farming practice. 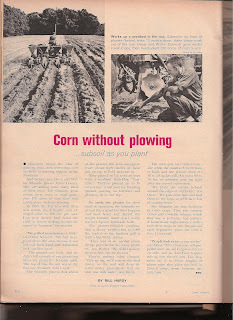 The following year, in 1965, Farm Journal did a feature on them and their No-Till planting technique. 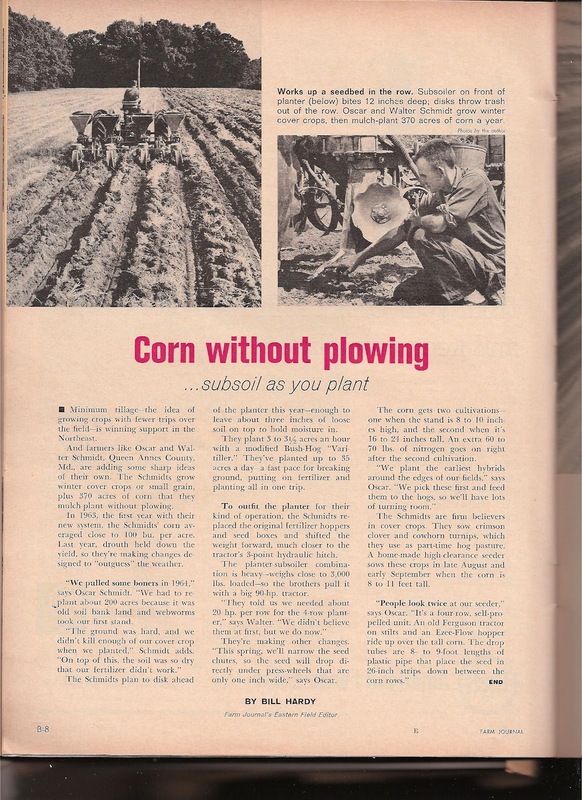 We've pretty much be no-till farming for nearly 50 years, well ahead of the curve of when the technique became "main stream" in farming. So with that as the historical context of doing on-farm research, our family continues to be active in conducting research to the benefit of our own farm as well as for the larger agricultural industry and ultimately, you the consumer. We partner with research groups, seed companies, and most especially with Cooperative Extension. Many of you have benefited yourselves or perhaps attended a "land-grant university" from which Cooperative Extension heralds. Land-Grant universities were given the mission of teaching practical agriculture, science and engineering and today's Extension service is still critical in researching and disseminating non-biased information and agricultral techniques. 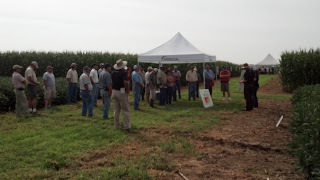 Last week, we hosted a field day with one of the research groups who conducts on- farm research on our farm. Farmers came from throughout the region and even a bus load of farmers from around the country who were in Washington DC visiting the capital decided to get out of the city and onto a farm in Maryland. The research group provided a detailed assessment of how the varieties trials were going this season and the different performance of the seeds under various controls for fertilizer and other research parameters. Lots of data. Believe it or not, farmers (or at least some farmers) like data. We use this data in determining what varieties to plant, what varieties are most suitable for our soil types and growing conditions, particularly under irrigation versus dryland crops. 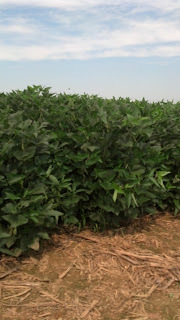 Research varieties are generally pampered to see what their potential is under ideal conditions. 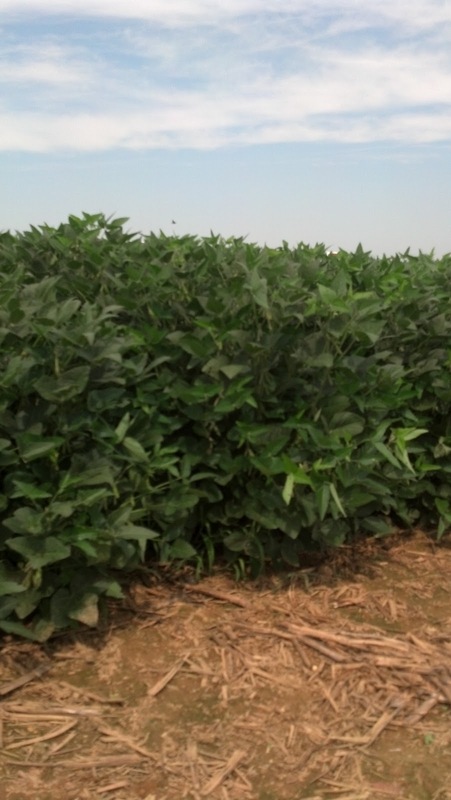 These research soybean varieties below are spectacular looking and should yield very well as they reach harvest. 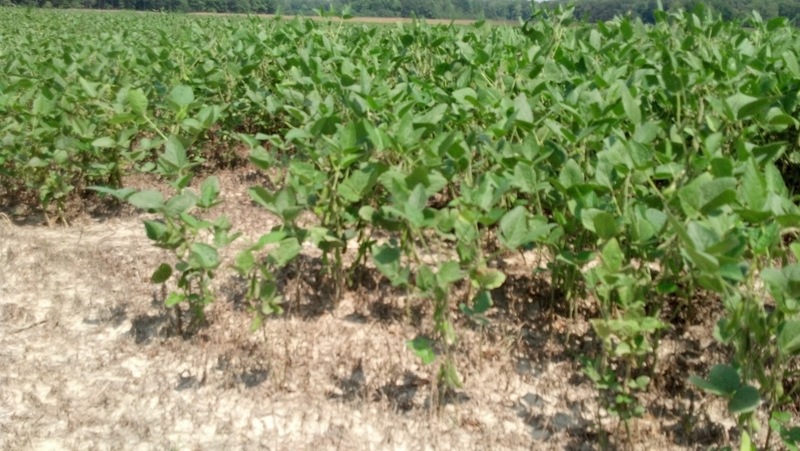 These soybeans below are dryland (non-irrigated) soybeans which are more typical this year because of the drought. A remarkable difference between irrigated and non-irrigated plants. We even conduct winegrape research in partnership with the University of Maryland. 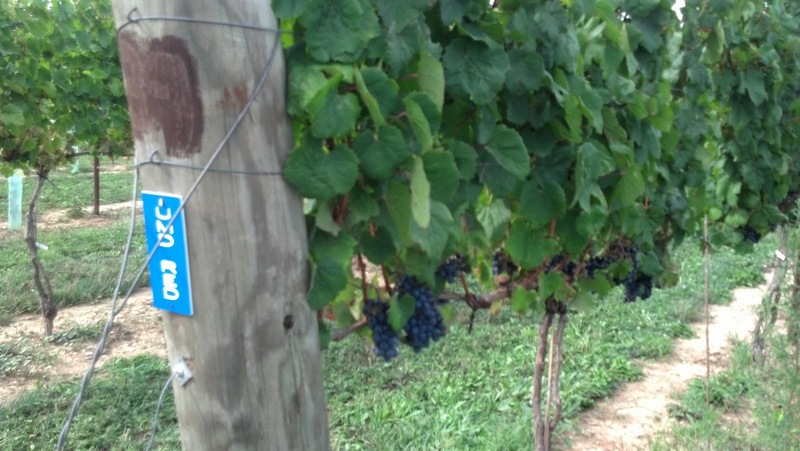 Within our 22 acre vineyard, we have 24 winegrape varieties planted as part of a Northeast regional research effort called NE10-20 testing to see how unusual varieties not typical for the Northeast region grow under our conditions. So for the past 50+ years, our farm has been growing answers. Answers that have helped us grow better, safer, more abundant, more nutritious foods. Answers that have helped us improve and preserve our soil. Answers that have helped us improve the water quality for the Chesapeake Bay watershed. Our family farm is committed to on-farm research because it improves our knowledge as farmers, enabling us to improve our farm and thereby improving the environment around us and the food on your table. 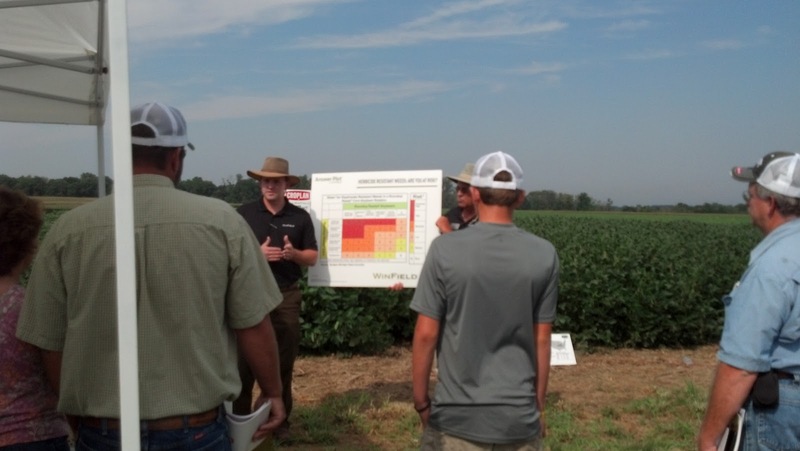 On-Farm research is a win-win for both the farmer and the consumer.